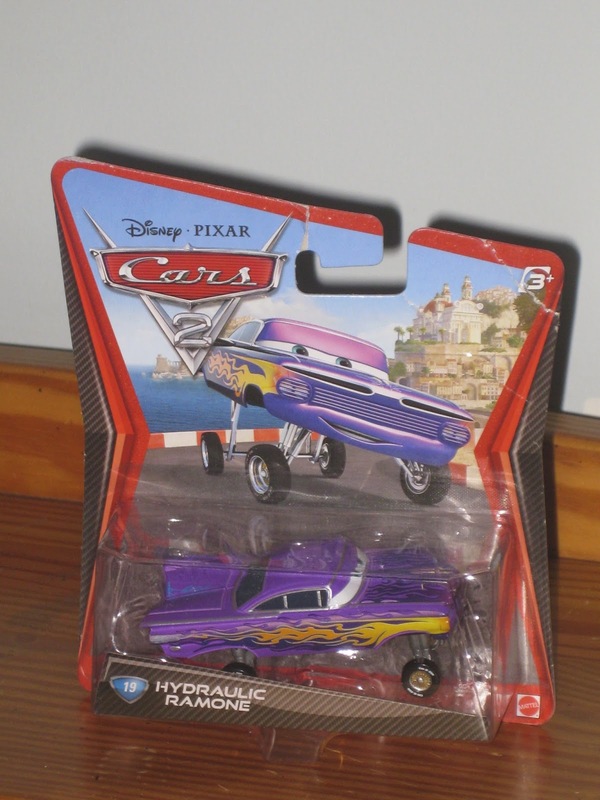 For the last day of my Cars Ramone themed week, we're going back to his classic purple paint job with flames...this time with hydraulics! Although this car was released in the Cars 2 collection, he never actually appears this way in that film, only in the original Cars (screen shot above). In fact, you never see Ramone with his purple look anywhere in Cars 2 as his only three paint jobs were green, "Union Jack" (British flag) and orange tie dye. Either way though, this is a great car and it made fans happy when it was released. Ramone with his hydraulic look was long awaited! To wrap up my collection of Ramones, also visit posts I did previously, Green Ramone and another one called Hydraulic Ramone (even though his hydraulics aren't even extended, I don't know why they called him that). And like mentioned in yesterday's post, my hard drive unfortunately deleted the pictures of two other Ramones I have, Lightning Ramone and Radiator Springs Ramone. I will post those as soon as I'm able to take new pictures! I know there are a few other Ramones out there that I don't have here on my blog or in my collection, such as Ghost Light Ramone, Wedding Day Ramone, Retro Ramone and Christmas Cruiser Ramone, but that's because I'm just a collector of cars seen in the actual two films. The only one I'm actually missing from the films is the Cars 2 Union Jack Ramone (that was only released in a Target gift pack). If anyone has an extra or would like to sell theirs, just shoot me an email! Thanks for stopping by and checking out my collection. Be sure to come back daily for much, much more coming your way!